I trust you are about as sick of the cold as I am, that being said, I embrace this weather and live through it...its like the last bit of a giant climb...seeing the top just ahead. This year has new meaning to me in that much is at stake to be successful - June is around the corner and the kids are already looking forward to camp at Camp Odayin. That's right - remember camp? Remember not being able to wait until the time came to get in the car or bus and head out to the great unknown - get away from mom and dad and the annoying siblings? Lets keep this in mind as we ride this year - be it racing, crewing, helping with fund-raising, encouraging us on training rides, the pat on the back....a "job well done"....all these things will bring us as Team Strong Heart a step closer to success. I am not the best in training - it is not easy for me to find the joy of the indoor trainer...I have taken a new approach to put as many miles outside as I can - in the tough weather, in the great weather...the idea is to be able to get tough mentally as well. With the help of coaches and prior racers - it will be "easy" to keep on track but come open roads, the miles will begin to compound even more. Extra rides - long rides - trips to Stillwater to do 3 mile long hill repeats and so on. This is not only a time to see Team Strong Heart get strong - but a chance for you to join in on the best sport this planet has to offer....cycling. So your dollars are needed - yes this is true and "no" I am not afraid to ask but also consider some other things that are critical - your time and your encouragement. I - along with Steve - would agree that our group rides have some of the greatest people I have ever known....not to say that the folks in Long Lake or NH are not - just saying that we are fortunate to have close friends that have stood out in the crowd and have given their best to help. TSH09 - this is my focus...this is my reason for getting up each day (aside from the normal gig) and when I look ahead to Feb.....June....we have some major things to cover....but as this team moves ahead...so does our community. I thank you in advance for your support. Hey everyone - I trust you are all doing well and for the hearty MN folk...I hope you survived the cold snap of a week ago...man, I really want summer to come back to MN. With soooo much to do - I....WE need your help. There are many things to attend to and we are doing a great job in all areas but the one thing that needs more attention is financial obligations - of course. Who doesn't need more money right? Well, I understand the economic times are not favorable for all...trust me, I have been there and for those that know me - well....you know the deal. TSH is still in fast forward to make this a reality for the kids at Camp Odayin. I am glad to say that we have a strong handful of crew but need more....we have vehicles that will take us through the heartland of the USA....and the money is needed to pull all things together. Here is what I ask - do you have outlets by which you can promote TSH and Camp Odayin for us? Exposure is the name of the game. If you know us - then you know we are serious for the kids and we give a generous amount to a valid and noble cause. If giving financial support is not in the cards - then maybe you can help us spread the word. Dont heistiate to ask how you can help...asking is the first step to knowing. If your company or the company you work for is into matching funds or interested in giving - this is a great way to give to a local venue. We will be promoting fund-raisers with the help of Trailhead Cycle/Fitness soon and we are planning events to get this jump started even more. I have some flyers / brochures and personal donation cards at the shop if you are local...just ask the friendly workers...they should have them on the ready. I am excited and the team is in full prep for this race and your help/efforts and prayers will get us there. Team Strong Heart (TSH) 2009 has sent out our press-release to various locations in the United States (local and national representatives) with the intent to drive two main goals home. First is for Camp Odayin and the second is for Team Strong Heart fundraising. We have had tremendous success with media outlets in years past and have developed a unique niche and reputation in many circles for the passion we have demonstrated with TSH. This year will be no different. I plan to be busy and to make myself available as much as I can but also our entire team is ready to do their part...What a great way to start the new year. I guess I have to remember to train for this too. 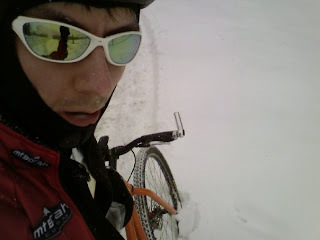 If you see a biker on the road this winter in our area - on an orange bike making his way through the snow - it might just be me fighting back Ol' Man Winter.